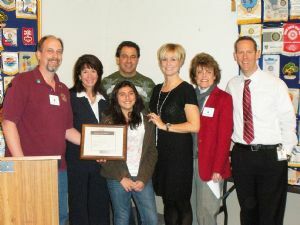 Rotary congratulates its March Student of the Month, Arya Aziz. The Oak Meadow Elementary fifth-grader received mountains of praise for her efforts inside and outside of the classroom. Arya Aziz taught her classmates and teachers at Oak Meadow Elementary about the importance of recycling. The fifth-grader's efforts have made her school 'greener' and caught the attention of her teachers and school administrators, who nominated her as the Rotary Club of El Dorado Hills Student of the Month. "She's just an amazing young gal," said teacher Cindi Prahl at Rotary's Wednesday meeting. "She helps other kids before she helps herself." The communities investment in Arya "will go far," Prahl continued, adding that she wished she had 100 more students just like Arya. Oak Meadow Principal Barbara Narez also praised the girl, saying she embodies all the "good characteristics" of a child. "She sparkles!" At the breakfast Arya was also joined by her proud father, James Aziz, as well as Buckeye Union School District Superintendent Terry Wenig and Oak Meadow Asst. Principal Pal Stewart. The Rotary Club gave Arya a plaque and a savings bond, along with a big round of applause, for her scholastic, social and environmental efforts.